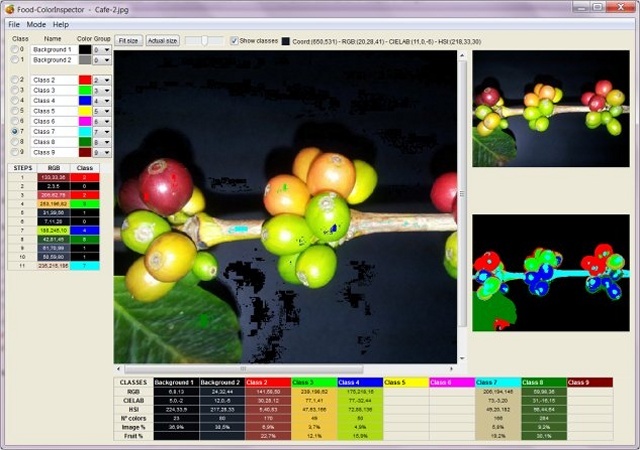 FoodColorInspector allows the easy and fast creation of segmentation models for colour images and the analysis of the colour of the objects in different colour spaces. Using the selected data, a pixels classification model is created based on the Bayes theory to assign all the pixels in the image to the different classes used in the training. Two classes are available for the background and other nine classes for the objects. The name and colour for the representation of each class is fully customizable. Possibility of grouping different colour classes in one logical class. Easy association of regions of interest in the image with the classes using the mouse. Training of different classes step by step. Possibility of deleting any step. Full information about the colour selection for each step and each class in different space colours. On-line visualization of the final result by updating the segmented image after each step. Possibility to save the segmented image to a file. Possibility to save the dataset of the training in a text file. Possibility to continue a saved training.